THE BEST OF ENEMIES is a timely drama based on real life events set in 1971 about two individuals, a KKK leader and a civil-rights activist, who are forced to work together to solve their community’s school integration problem. THE BEST OF ENEMIES is an uplifting, well-acted movie that shows faith and civility overcome racism in the most hardened of hearts. MOVIEGUIDE® advises caution for older children due to some foul language and other mature elements. 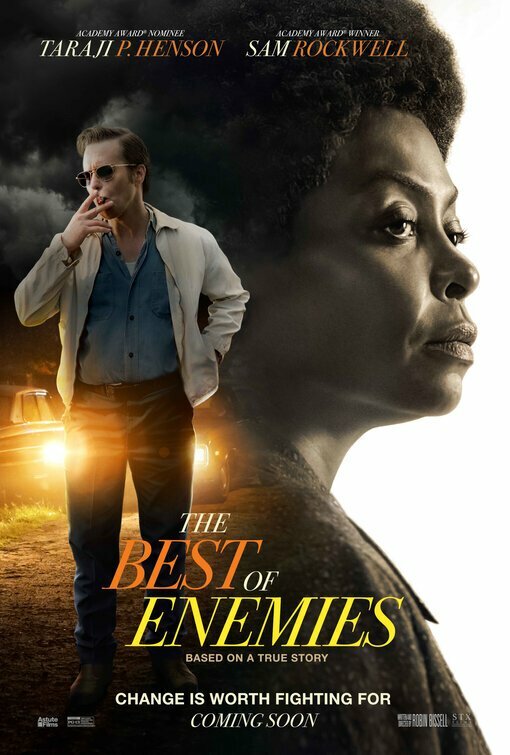 THE BEST OF ENEMIES is a timely drama based on real-life events set in 1971 about two individuals, a KKK leader and a Civil-rights activist, who are forced to work together to solve their community’s school integration problem. To everyone’s shock, the two polar opposite people eventually become close allies and friends. THE BEST OF ENEMIES is a story of radical transformation that’s not featured enough in movies. However, the movie contains some mature content that warrants caution. BEST OF ENEMIES takes place in Durham, North Carolina in 1971. Ann Atwater (Taraji P. Henson) is a tough-as-nails Christian civil-rights activist working to improve the living conditions of the poor African-Americans in her community. A single mother of two, all Ann has known is struggles, so she utilizes her rights as a citizen to fight for improvements. When the school for the black neighborhood has a fire, Ann (with help from the NAACP) has an opportunity to force the city councilman’s hands to finally desegregate the schools. A local judge doesn’t want to anger the white people in the community, so he holds a special public meeting, a charrette, so that the community can discuss the pros and cons of integration and come to a resolution. The charrette is led by Bill Riddick, an African-American man with a unique ability to persuade people. In order to have the best possible outcome for the community, Riddick asks Ann Atwater to be one of the co-chairman on the charrette, and he also asks Klansman leader C.P. Ellis to represent his people as a co-chairman. Ann and C.P. Ellis hate each other, and both refuse to work alongside the enemy in any capacity, but eventually, the two agree, though very, very reluctantly and begrudgingly. Ellis (Sam Rockwell) owns a gas station, but struggles to provide for his family. He’s a beloved leader in the KKK community and wants what’s best for his family and kids. In his mind, school integration is not that. As the charrette continues, Bill Riddick forces situations where individuals, white and black, have to talk and listen to each other. At one point, people are assigned seats for lunch where they’re forced to sit next to someone of a different race. While the charrette is rocky and tense, C.P. slowly begins to see how wrong his worldview is. In one conversation with Ann, he tells her he reads the Bible and attends church, but she responds saying that the same God who made him made her. When it comes time for the people to vote, will they agree and pass the important resolutions? Or, will hate and discrimination prevail? THE BEST OF ENEMIES is a wonderful true story of unity and changed hearts that’s sorely needed in a time of social division. The movie is superbly led by Taraji P. Henson and Sam Rockwell, who both command the screen with their strong, but distinct, personalities. While there’s an ample amount of humor, the cinematic tone is a constant reminder that there’s real-life implications to the racial tensions taking place. For a movie that’s centered on creating a political change through activism, the conclusion is more personal, asking the viewers to simply make a change by listening to one another, especially those who are different. For many, the thought of a Klansman leader who hates black people and a black civil-rights activist who despises white people becoming friends makes no sense. What can’t be missed in the story is the Gospel’s role in bringing the community together. Though Ellis claims to be a Christian, as do other racist characters in the movie, it’s a nominal faith where fruit is obviously lacking. In a real-life interview afterwards, Ann says that Ellis went “from a Klansman to a Christian” when he changed. THE BEST OF ENEMIES is a reminder that the Gospel has the power to soften any hardened hearts. That said, it must be stated that one can claim the Christian faith, yet suppress the basic biblical principle that we’re all made in God’s image regardless of race. In one scene, a church deacon is described as an angry man who doesn’t like anyone, period. This was true of many Christians in the past, and even still today, and should be readily rebuked. What THE BEST OF ENEMIES teaches viewers, however, is that no one is beyond change and redemption, no matter which side of a political divide they sit. While not the crux of its argument, THE BEST OF ENEMIES inserts a free market, pro-capitalist argument against racism. Thus, Ellis owns a struggling gas station business is struggling, but his wife suggests that, if he didn’t refuse serving African-Americans, nearly half the population, then maybe they’d be doing better. In other words, bigoted discrimination against people with a different skin color is bad for business. THE BEST OF ENEMIES has great moments of drama, humor, faith, hope, and love, but there’s also a fair amount of foul language, racism and other mature content that warrant caution for older children and other viewers. Lots of racism but it’s rebuked. THE BEST OF ENEMIES is based on real life events in Durham, North Carolina in 1971. Ann Atwater, a single mother, is a civil-rights activist working to help poor families in the African-American community improve their living conditions. When school integration looks like it could happen in Durham, Ann is asked to co-chair community discussions along with C.P. Ellis, the head of the local KKK. These enemies refuse to work together, but over time, the most unlikely of things happens, and the two become friends. THE BEST OF ENEMIES is a wonderful true story of unity and changed hearts that’s sorely needed. The acting, direction and writing is excellent. Positively, there’s positive Christian faith throughout the movie, and racism is rebuked. The two polar opposite individuals learn to listen and empathize with one another, realizing that we’re all made in God’s image. THE BEST OF ENEMIES has great moments of drama, humor, faith, hope, and love. However, there’s also a fair amount of foul language, racism and other mature content that warrant caution for older children and other sensitive viewers.